Haloumi is a cheese that finds its origin in Cyprus. It is non-aged and made from goat, sheep or cow’s milk. It has a very high melting point, therefore it is easy to grill. In a glass jar with lid, add all the ingredients for the vinaigrette and shake. Ready. Take an oval serving tray and place the lettuce in the middle, piled up. Chop the cherry tomatoes roughly. Wash the asparagus and slice them lengthwise into 2 halves. Heat 2 tbsp. of olive oil in a grill pan. Grill the asparagus on both sides for one minute only, so they stay crunchy. Spread out the asparagus over the salad. Slice the haloumi 1 cm thick. In the same pan, heat another 2 tbsp. of olive oil and grill the haloumi for 1-2 minutes each side. Or until you see the grill marks on the cheese. Take away from the pan and sprinkle the cheese with lemon juice. 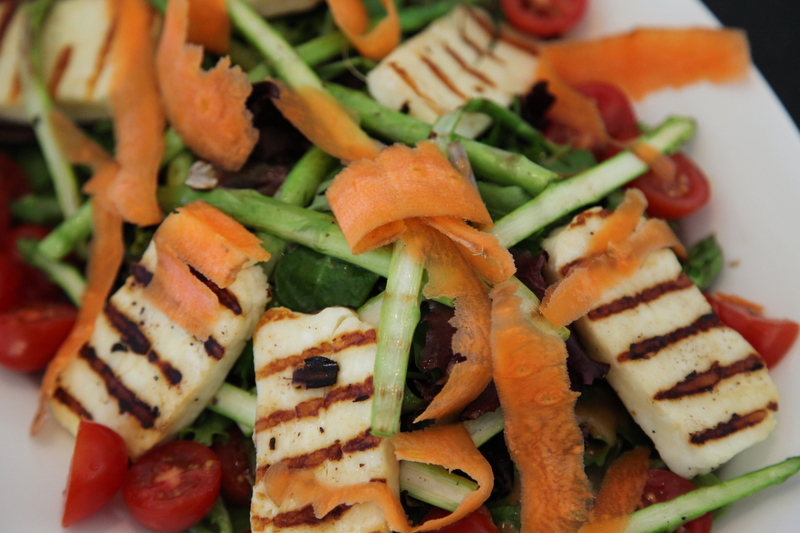 Organize the Haloumi nicely on top of the salad and asparagus. With a potato peeler, peel of some ribbons of carrot. Decorate the plate with it. Sprinkle with some freshly grinded black pepper.